Thank you Freckled Fawn, we really appreciate your generosity and support!!! Thanks to everyone who played along with us in June, we appreciate you all so much! One of you will be contacted and invited to be our Guest Designer for the month of August. 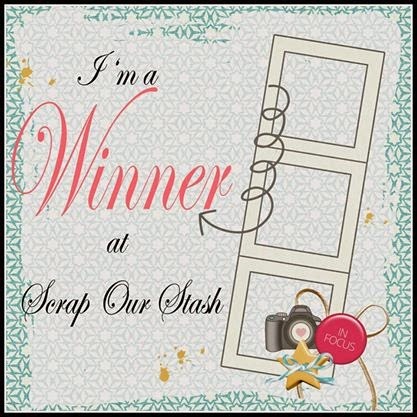 Leave a comment below AND email us at scrapourstash@gmail.com with June winner in the subject line and we will forward your information to our sponsor so that they can get your prize to you! Also, please grab our new WINNERS blinkie below, to add to your blog! But first we want to thank our current team for their awesome inspiration and dedication to our site during the past 6 months. Wishing you all the best in your future endeavors!! Click on each of the designers names to visit their blogs and remember the new designers will be formally introduced in July and will share with you their first SOS reveals!!!! Our June Design Team Top 3 and Monthly Prize winners will be posted tomorrow! Come back to see who won! Today is the last day to get your entries uploaded for the June challenges! Need a little bit more inspiration to get your mojo going? I also "tie-dyed" the flowers." "This was a fun sketch to use. 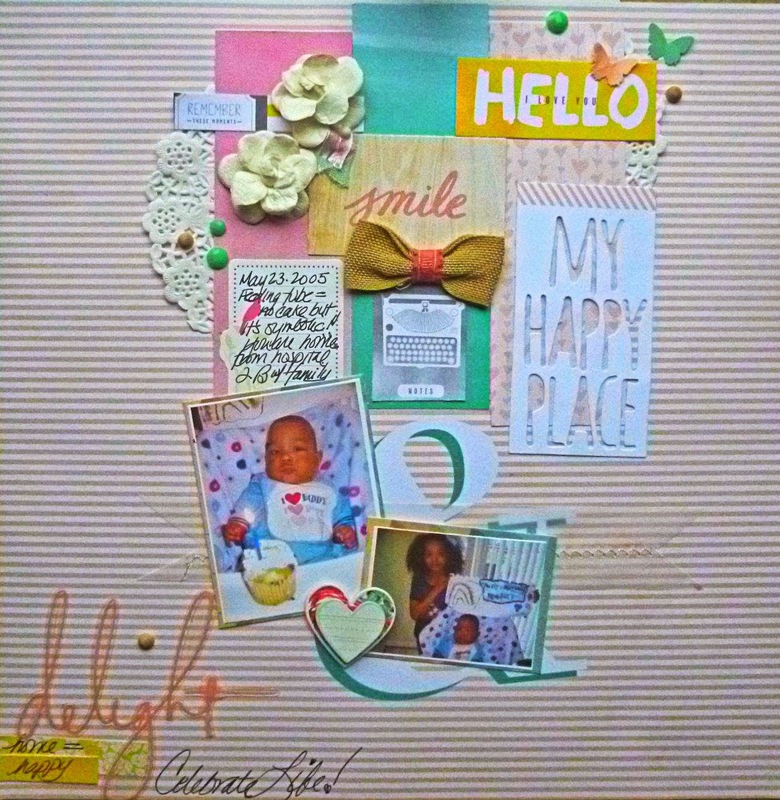 I used Pink Paislee " Hello Sunshine" Paper Collection for this layout as I like the colors which gave it a nice spring /summery feel. I used some of my favorite embellies on this layout, which included my lovely washi tape, twine, enamel dots, wooden veneers, journaling card, to name most. I enjoy being able to dig into my stash for random aphas, which in this case I used 2 different font types. Worked out perfect! For challenges and details, click HERE!!!! Make sure you return tomorrow for our last day of design team inspiration and also the announcement of our new design team!!! 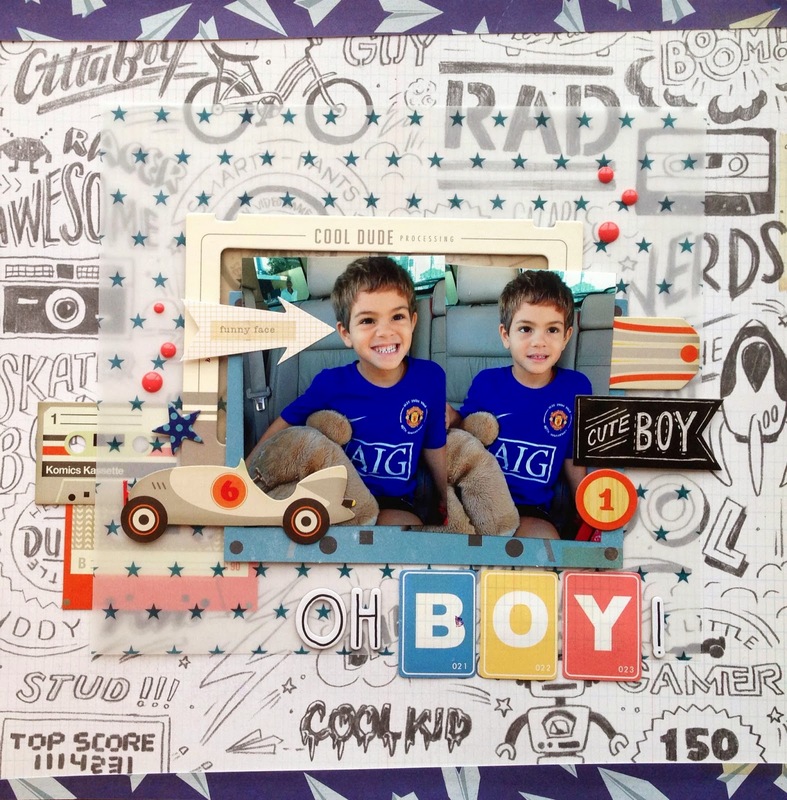 What better way to end the week than with some fabulous scrapbooking inspiration! 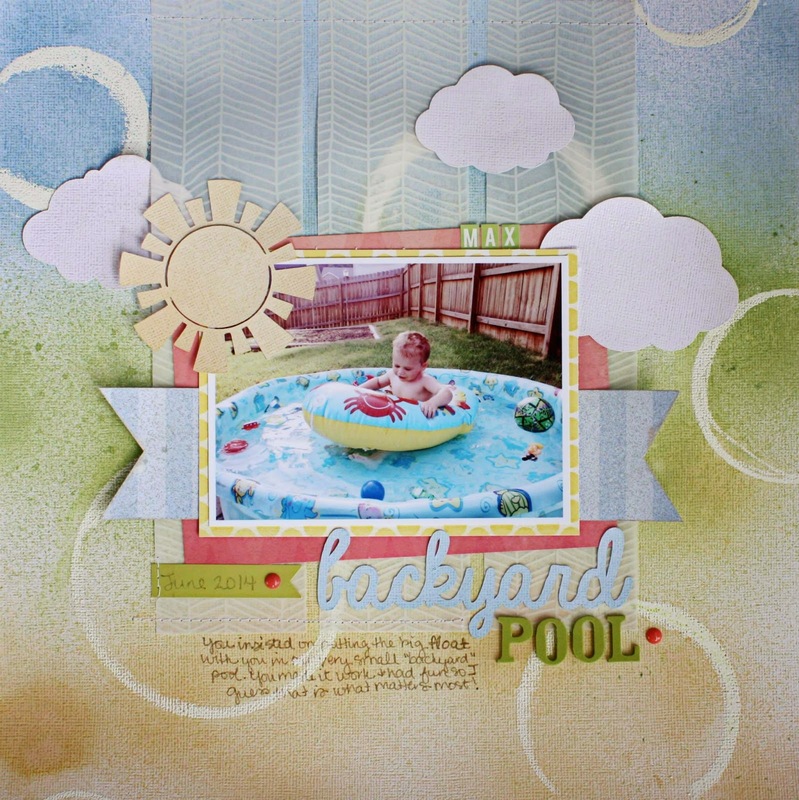 "For this layout, I scrapped a picture of my son, Max in our "backyard" pool. Even though it is small, he has a lot of fun in it! I followed the sketch fairly close but did only use one photo. I was inspired by the Tie-Dye Challenge to make my own background. I used some Sixxiz circle dies and a Versamark pen to draw the circles on white cardstock. I then embossed them with white embossing powder. After embossing, I sprayed the background with three different Mr. Huey mist colors. To keep the circles white, I wiped the mist off with a baby wipe. I used vellum for the strips going from the top - down on the layout so the background would still be visible. I used two enamel dots in dark pink and used green thickers for "Pool" and small green block letter stickers for "Max". to be entered into our June prize drawing. You will receive and entry for each challenge that you complete! and link it up with their site, you will earn an entry into their prize drawing!!!! Have a wonderful weekend and I hope you were inspired today to get your supplies out and get to scrappin'. We would love t see your take on our Sketch challenge combines with the Tie Dye challenge at Child's Play! I cut some circle ring in different sizes out of paper using the circle dies. Then I put them randomly on a white cardstock and glimmer misted it to get the "Tie Dye" look on the background. 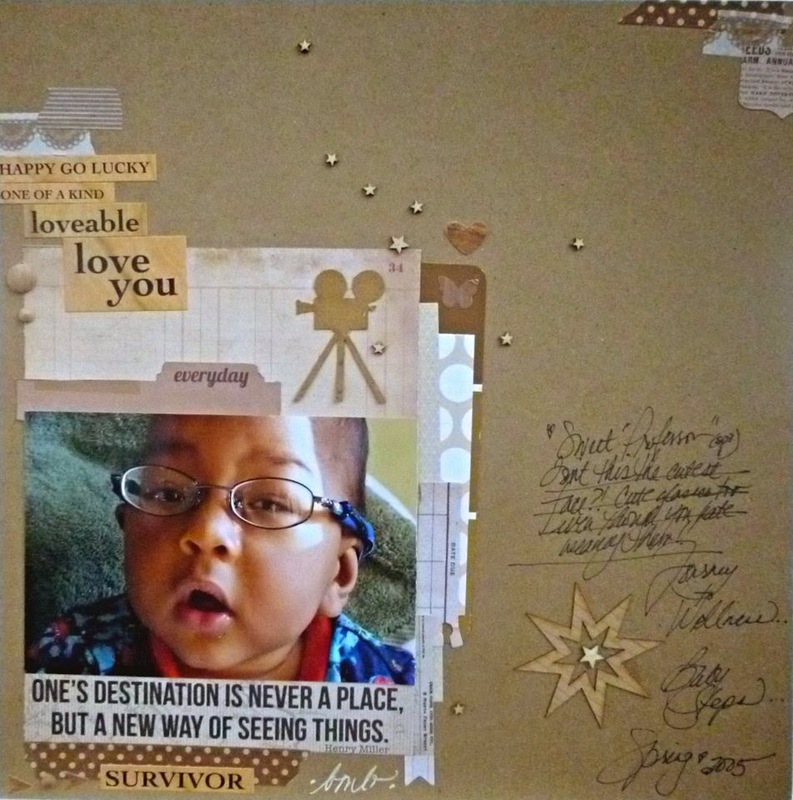 I chose to use some sequins to finish my layout." and link up to both sites you will be entered to win our monthly prize as well as the prize being offered at Child's Play!!!! Looking forward to seeing all of your creations inspired by our challenges! 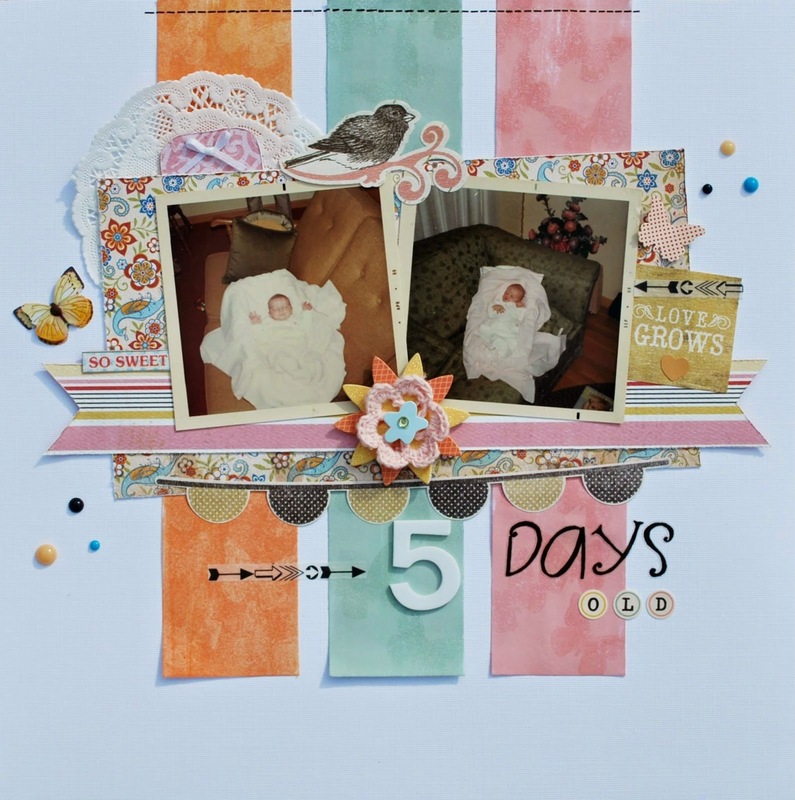 Today's inspiration is the beautiful creative work of DT Kerry, and is her last design team reveal for Scrap Our Stash! 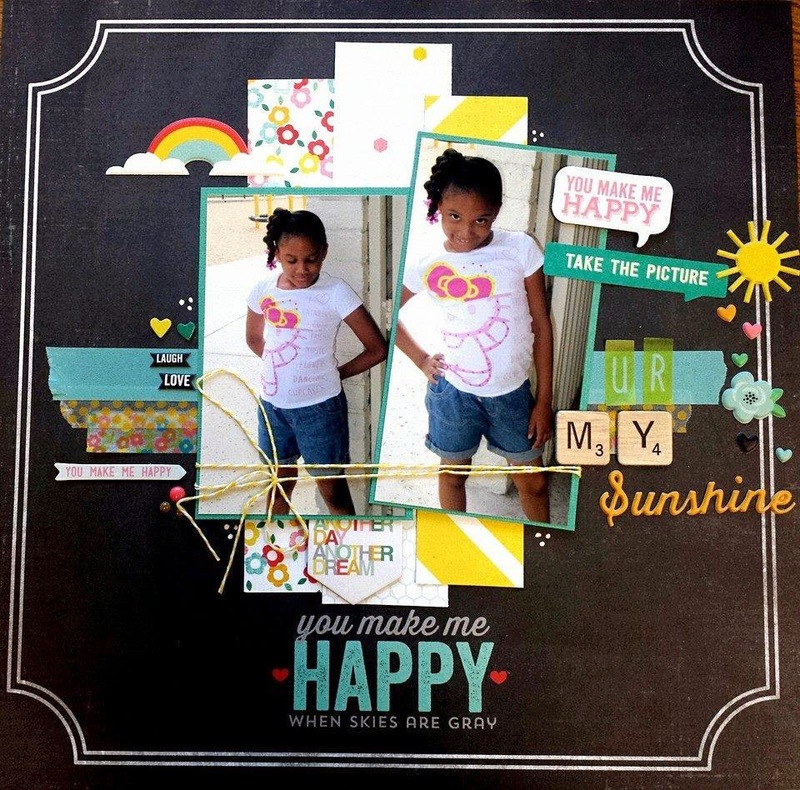 "I made the 'tie-dye' background using wet cardstock and strips of crepe paper. It was really effective and a technique I will be trying again for sure. I have made a tutorial on my blog if you would like to see how it was done. 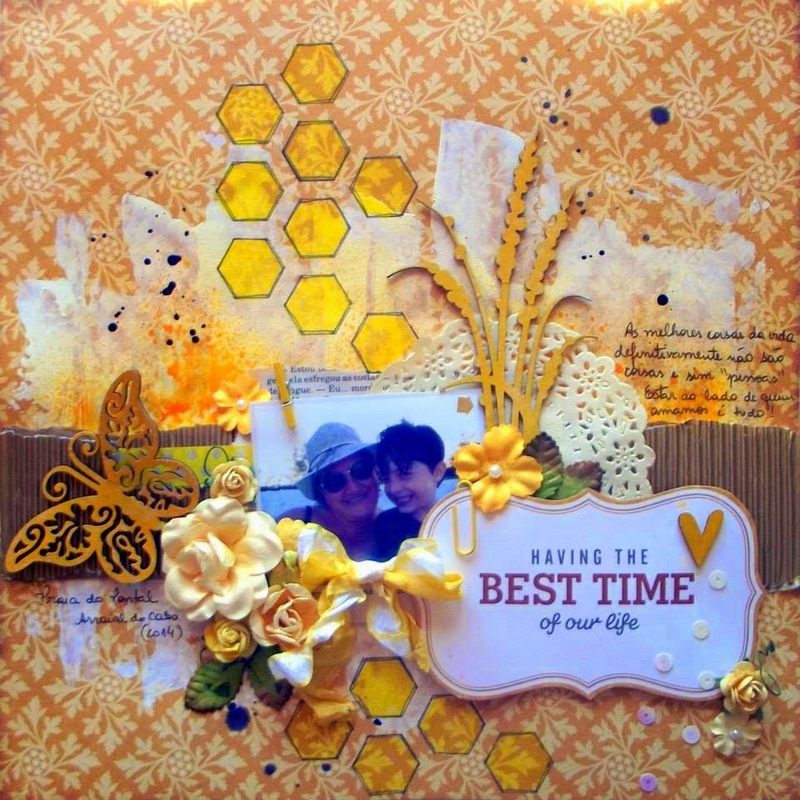 This is also my last layout for Scrap Our Stash, it's been a pleasure working with the great challenges and hope I get chance to play along as a participant." Kerry we have enjoyed having you as part of our team and appreciate all of your contributions to Scrap Our Stash! You will be missed and we wish you the best in your future endeavors and hope that you pop in when time permits! AND...if you combine our Sketch Challenge with Child's Play " Tie Dye" Inspiration Challenge and link it up here as well as Child's Play, you will be entered to win our monthly prize as well as the prize Child Play is offering...that is (2) chances to win a prize this month. Return tomorrow for more Design Team inspiration! 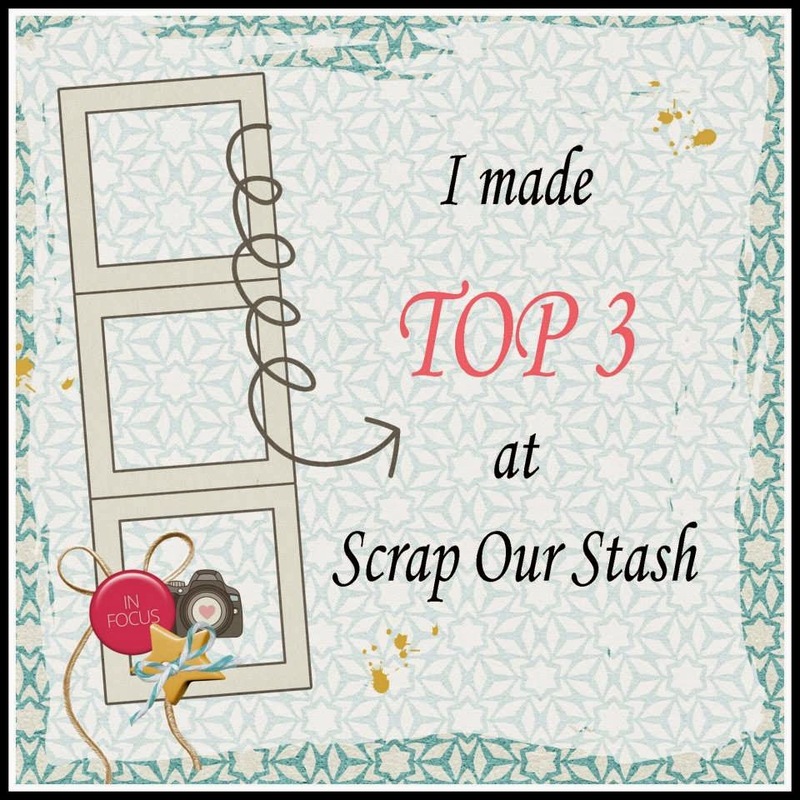 Scrap Our Stash! Kelly has been with Rochelle and I since we became co-owners of Scrap Our Stash and she will definitely be missed around here. "I "tie-dyed" my color strips using Versamark ink with a butterfly stamp. It was interesting to see the outcome of each color as it dried! I used Queen & Co. enamel dots and a super old glitter & crocheted flower in the center. I find it hard to scrap the older photos but this challenge really made it fun! I will really miss being a part of the design team here at SOS and have loved every one of the challenges! Brenda & Rochelle are amazing and really make SOS such a super fun challenge site. Thank you for allowing me to be a part of such a fantastic design team and I hope to follow along with future challenges!" Kelly, Rochelle and I have enjoyed as part of the SOS team, and appreciate all our your contributions and dedication to our site!!! 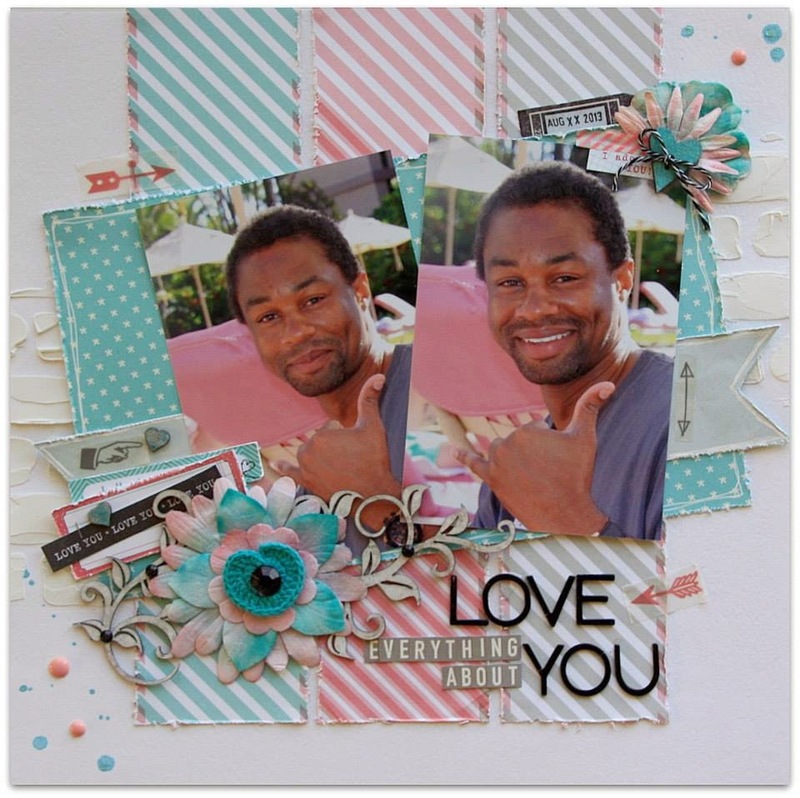 If you have enjoyed the inspiration Kelly has shared with Scrap Our Stash, click HERE and become a follower of her blog. Thank you for stopping by and as always, we will have more design team inspiration on the blog tomorrow! To go along with the Child's Play Tie Dye Inspiration Challenge, I sprinkled ink from spray bottles around the paper. Have you had a chance to play along with us this month? 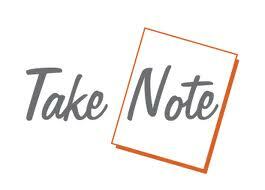 If not, you still have until June 29th, 11:59 PM to link up your take on either or both of this month's challenges! And...don't forget, to combine Child's Play "Tie Dye" challenge with our June Sketch with Stash Challenge for a chance to win not only our monthly prize, but also the prize being offered at Child's Play! Click HERE for challenges and details!!! 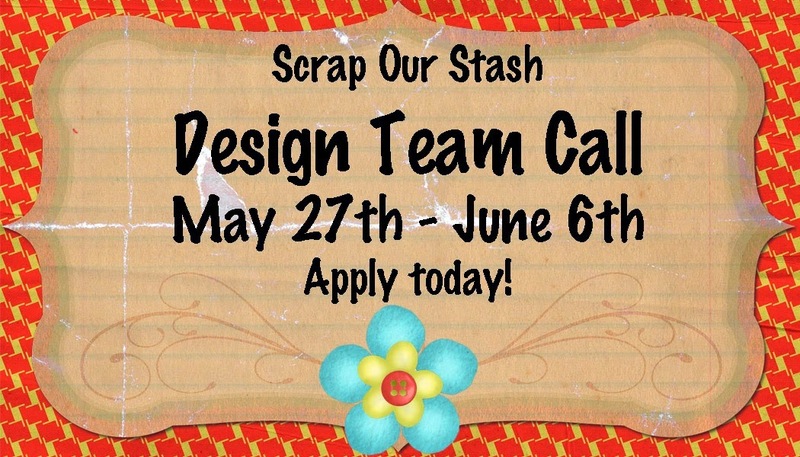 Stop by tomorrow for more Design Team Sketch with Stash inspiration! 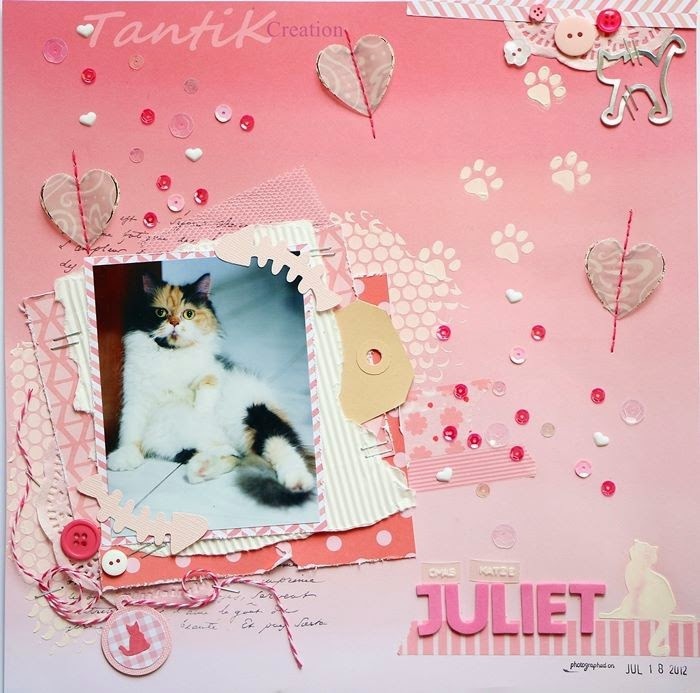 Today's amazing June Sketch with Stash inspiration is being shared by DT Jenni and is Jenni's last reveal as a Design Team member at Scrap Our Stash! We're gonna miss having her on our team and the wonderful "Start to Finish" videos she creates and shares with us! 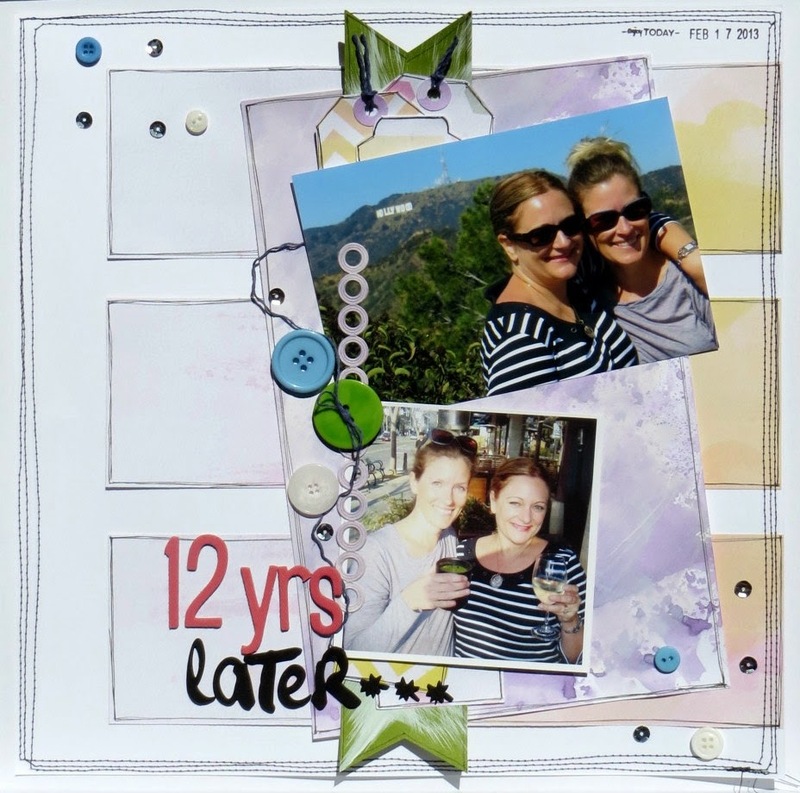 "Sadly, this is my last challenge as a DT member at Scrap Our Stash, so I wanted it to be special. I decided to focus on the idea of time passing so quickly! These photos are of a rainy day craft project from last summer. I tried to fade distress inks together with a roller stamp to mimic the vertical pieces in the sketch. For the stash part of the challenge, I used a combination of rub-on sequins, real sequins and enamel dots to embellish. I can't wait to see what everyone is inspired to create! I also want to thank all the amazingly talented DT for being so much fun to work with, and especially to Brenda and Rochelle for being a great leader, inspiration and friend to me!" 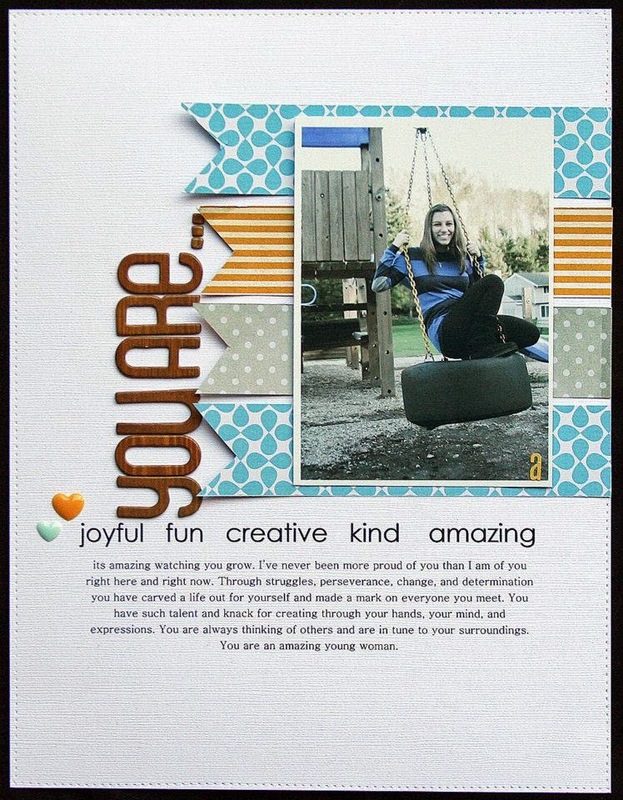 Jenni it has been a pleasure having you as part of the Scrap Our Stash team!!! Rochelle and I thank you and appreciate all of your contributions and dedication to our site! Wishing you the best in all of your future endeavors!!!! I hope you are enjoying your weekend!!! I have always loved photographs, but after I became a mother always walking with a camera in hand, has become very common. I love every little moment of registering children and then remembering how they grew, and how their characteristics have changed. This is a picture of my youngest qdo, when he was 1 year and a half or so. Today he is a little boy of almost 7 years. How I miss this cute and naughty face. The sketch is a grace and I loved playing with it. I decided to make some chevrons and paint with gelatos. For the background paper I used the colors in the photo for inspiration. I added enamel dots are on the left side of the photo. 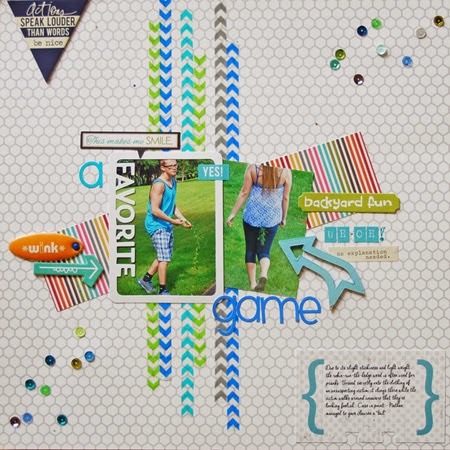 Link up your layout here and with Child's Play and you will be entered to win the monthly prize on our blog as well as the prize being offered at Child's Play!!! You have until June 29th, 11:59 PM to link up your entry!!! Thank you for visiting us today, return tomorrow for more Design Team inspiration! "Tie Dye" Inspiration Challenge over at Child's Play. Next I splattered some ink that was left over on the block, and added lots of sequins, my favorite embellishment to put into my layout these days." you will be entered to win our monthly prize as well as the monthly prize at Child's Play! 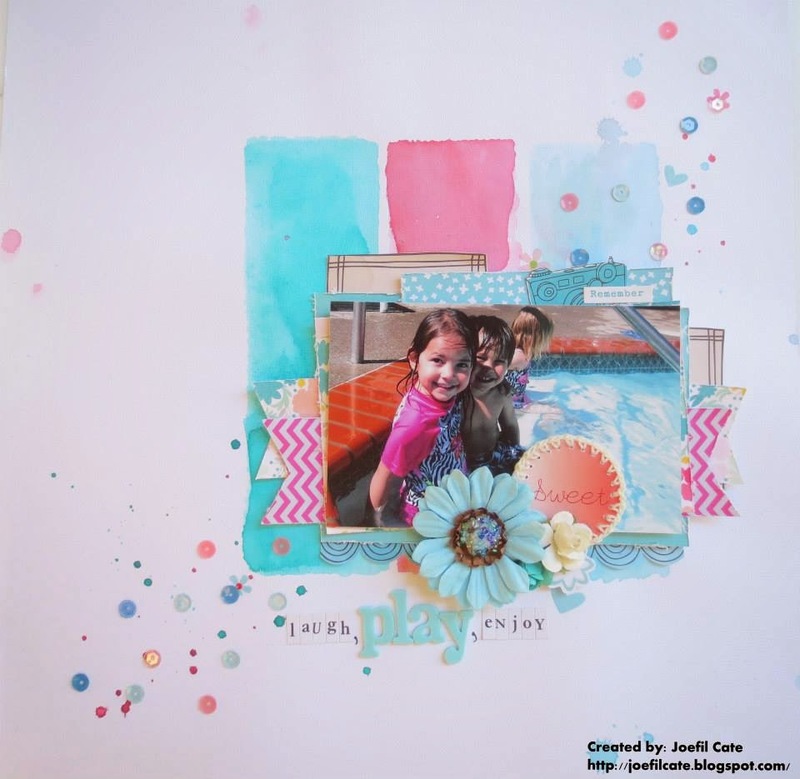 "I used the sketch but used some small pictures and was inspired by the Child's Play Tie Dye Inspiration, which made me think of light and pastel colors and embellishments!" and if you combine our challenge with Child's Play "Tie Dye" Challenge and link it up with Child's Play, you will be entered into their prize drawing...two chances to win a scrappy prize!!! We are looking forward to seeing how our Sketch Challenge and the Tie Dye Challenge inspires you! 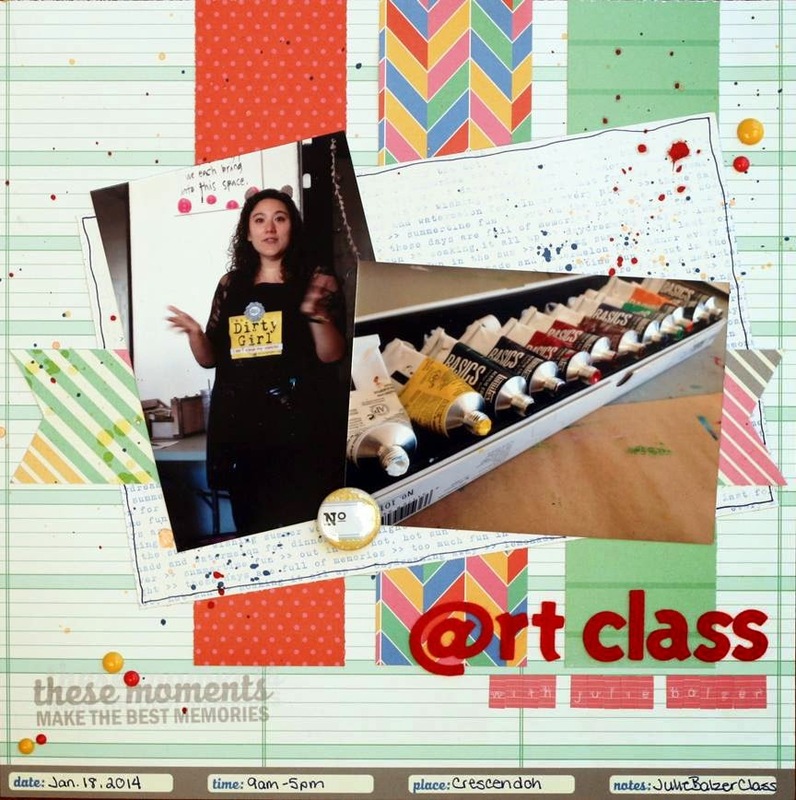 Make sure you stop by tomorrow for more Design Team inspiration!!!! "I was excited to do this sketch so I could do a clean lined layout, which are my fav to create! 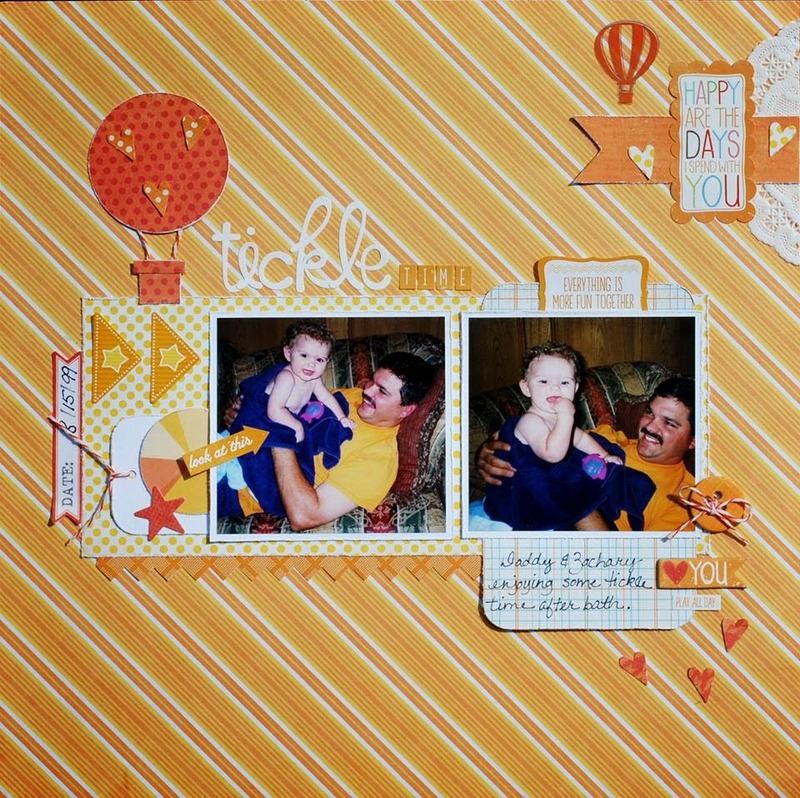 I love the easiness of this layout, yet it says so much!" AND....we have joined forces with Child's Play for this challenge. Complete our sketch challenge combined with Child's Play's " Tie- Dye" Challenge, link it up your entry here and also on the Child's Play blog for a chance to win our monthly prize as well as the prize the are offering on their site. Generously donated by The Freckled Fawn!!!! Thank you for stopping by and make sure you come back tomorrow for more design team inspiration! 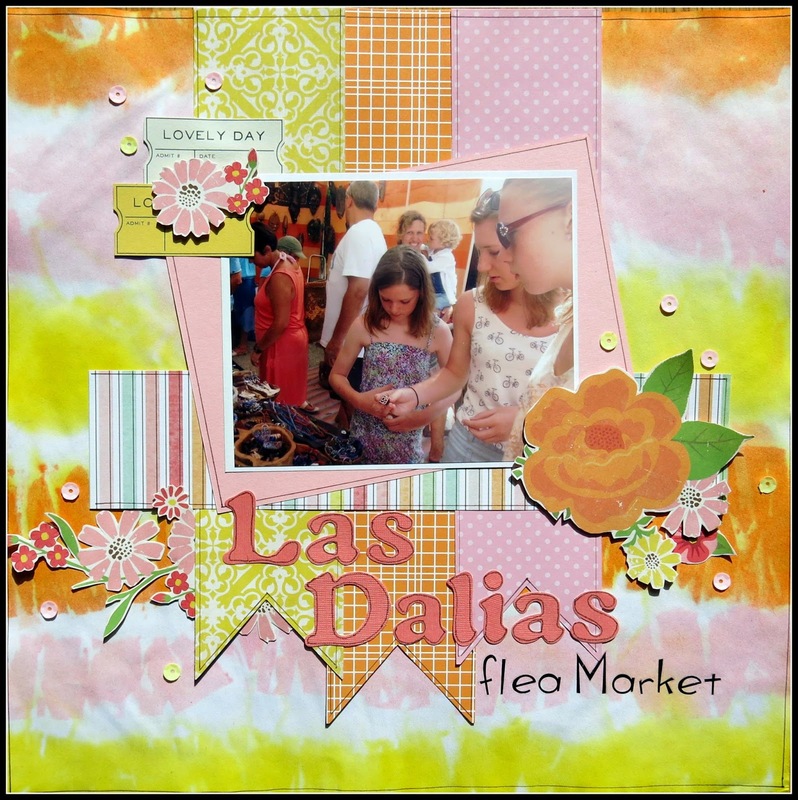 Today's amazing Sketch with Stash inspiration was created by DT Dulcinea. "I was so inspired by this challenge. I turned the sketch and make my strips to be on the center. I use the tie dye inspiration to make my background using white crayons and watercolor for an ombre look. Now it was time for embellishments, and what's more feminine than sequins and I love them. This layout is~ about my inspiring mom." We would love to see your take on this month's sketch! 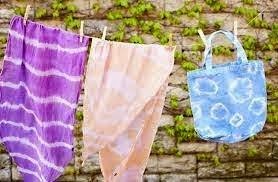 Combine our challenge with Child's Play, Tie Dye Challenge, upload it here and at Child's Play and you will be entered to win our monthly prize sponsored by The Freckled Fawn as well as the prize drawing at Child's Play!!! we are sad to see them go. for the past two terms. 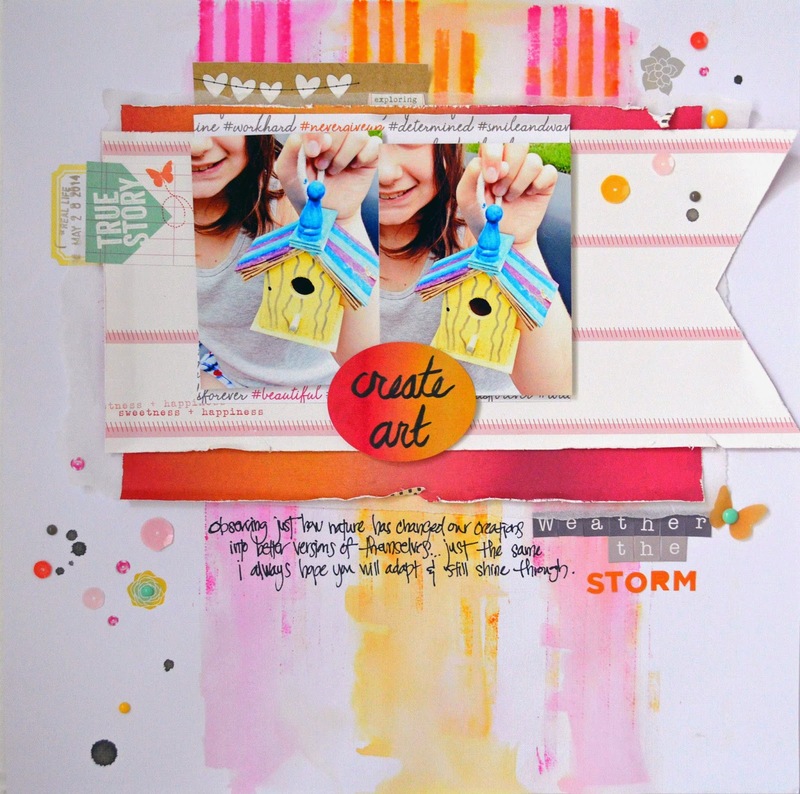 "I love sketch+stash challenges! I changed the sketch a bit... Instead of stripes on the back of the photo I used a large square of vellum paper. 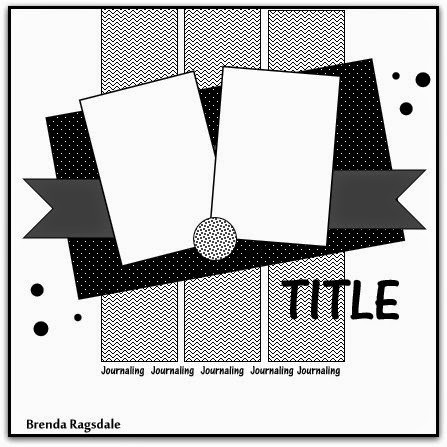 For the stash part I chose to used enamel dots and 2 types of alpha for my title!" You have been an awesome team member and truly inspiring and Rochelle and I appreciate all of your contributions to this site! If you want to continue to be inspired by Carol's work, click HERE to follow her blog. More Sketch with Stash inspiration on the blog tomorrow, make sure you stop by and see what our next Design Team has created to inspire you! Time for our monthly Sketch with Stash Challenge, and as a BONUS we are teaming up with Child's Play "Tie Dye" Inspiration Challenge! "Great challenge! 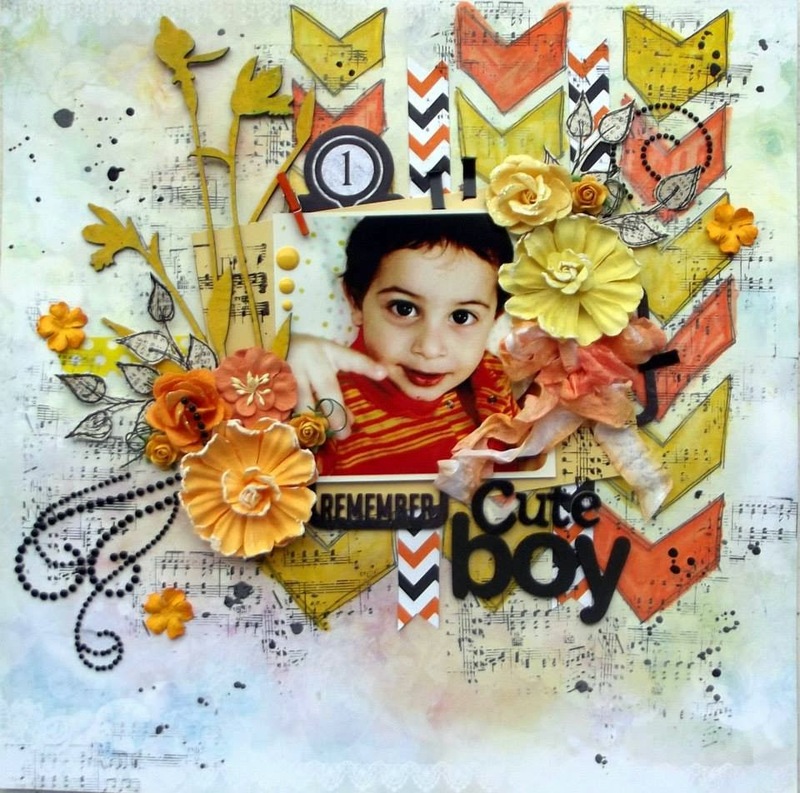 I had lots of fun creating this layout because I did something I haven't done in a long time, used my Tim Holtz distressed inks. Interestingly enough I do not have any purple in my stash, I have all the other colors of the inspiration board but purple. So I pulled out my TH concord distressed ink and made my own purple tie dye-esque layer and to wash it out, I added some gesso. I side flipped the sketch to accommodate landscape photos. For my stash items, I used the last of my sequins, and I use two Thicker alpha stickers, Amy Tangerine kal barteski foam and American Craft patchwork fabric. I'm also working on my stash of button. I look forward to seeing all your wonderful layouts using this week's challenges." Looking forward to seeing everyone's take on this challenge! 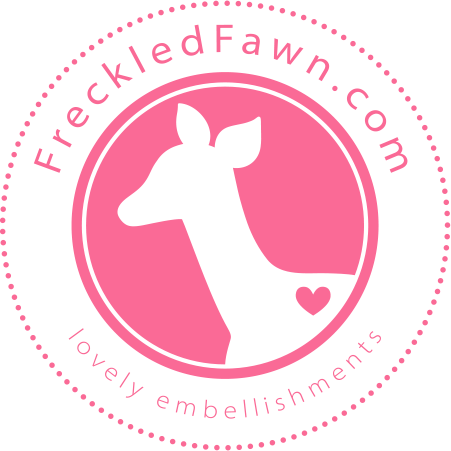 Freckled Fawn specializes in craft embellishments. Their mission statement is to create products that please the eye and delight the heart. 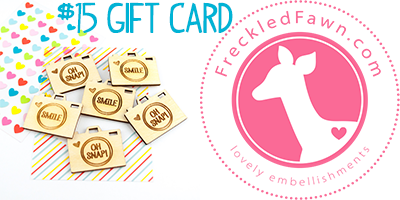 In September 2013, Freckled Fawn launched their OHDEERME Embellishment Kit Club. Make sure you come back tomorrow for out June 15th Sketch challenge reveal! 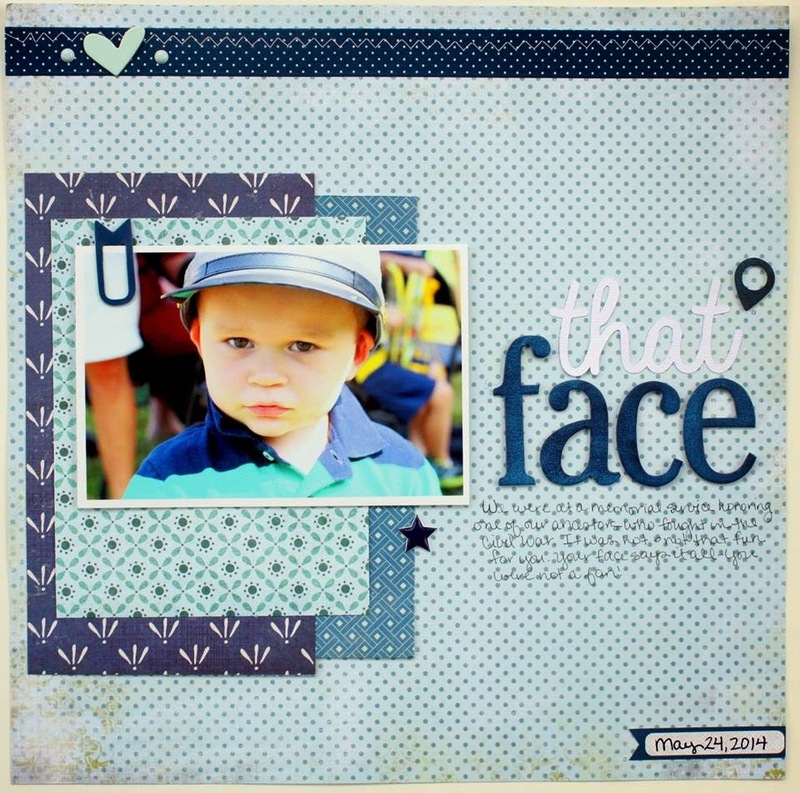 "For my layout, I used different shades of blue as I felt they complimented this picture of my youngest son, Max. 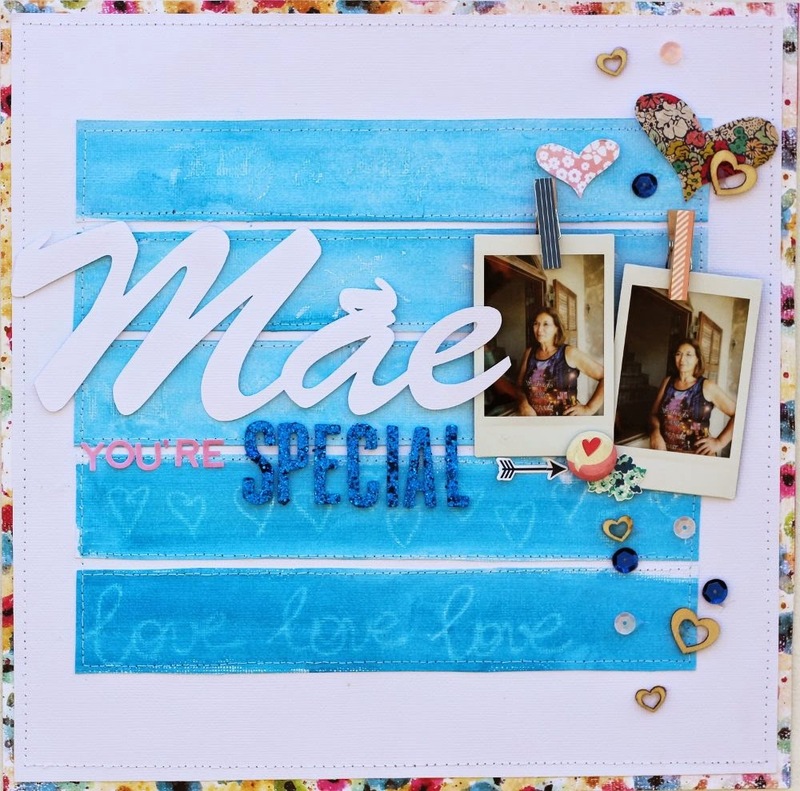 For the title, I cut "that" with my Silhouette Cameo and used some older K & Company chipboard letters for "face". The chipboard was a lighter blue, so I used some prima chalk ink to darken the letters. My five different stash items used were 1 washi tape (navy polka dot), 2 chipboard shapes (heart & geotag), 3 puffy stickers (star & small dots), 1 flag clip (navy) and 1 label sticker." Three different pink washi tapes. Six heart shape puffy Stickers. You have until June 29th to complete this challenge. For more information check HERE! 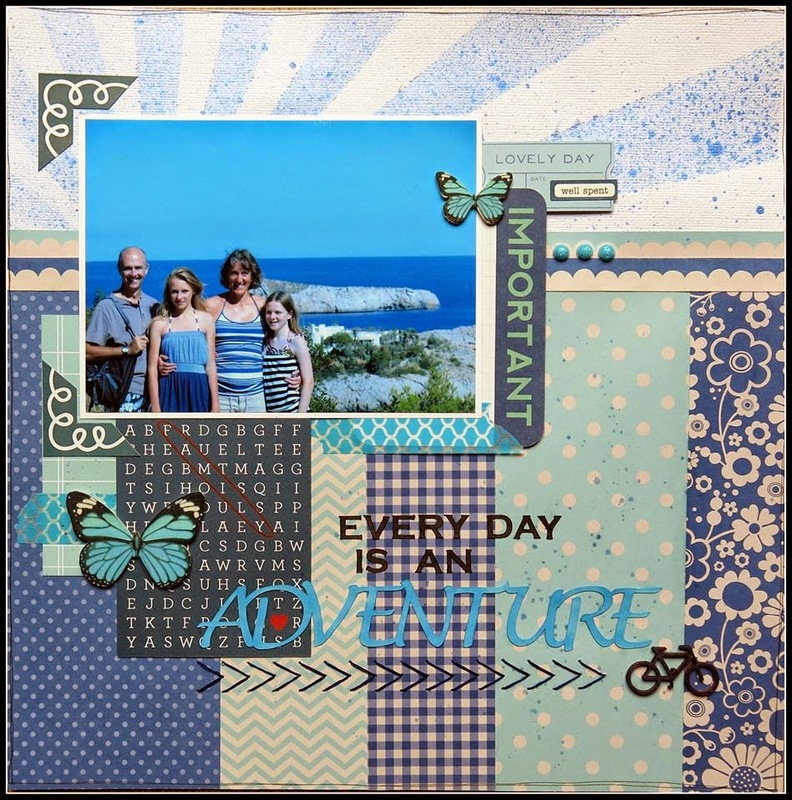 "The photo was my starting point with this layout as it was virtually all blue, then I grabbed my Pebbles Basics collection and found two shades of blue in different patterns. The top was misted once with blue ink then misted again using a sunburst mask. Then the real fun began - hunting through my stash for blue embellishments. Here are the five items I added. 1. wooden butterflies and bicycle. 2. two project life cards. I look forward to seeing your monochromatic pages. "I am such a fan of color and usually bright colors so when I saw it was a monochromatic challenge, I thought how about orange! I had fun digging through my stash for stickers, chipboard (button & 'heart' you), vellum (small hot air balloon), twine & a doily for my 5 stash items. I also used products from Echo Park, Basic Grey & My Minds Eye. When I came across the vellum hot air balloon, I decided to create my own hot air balloon. 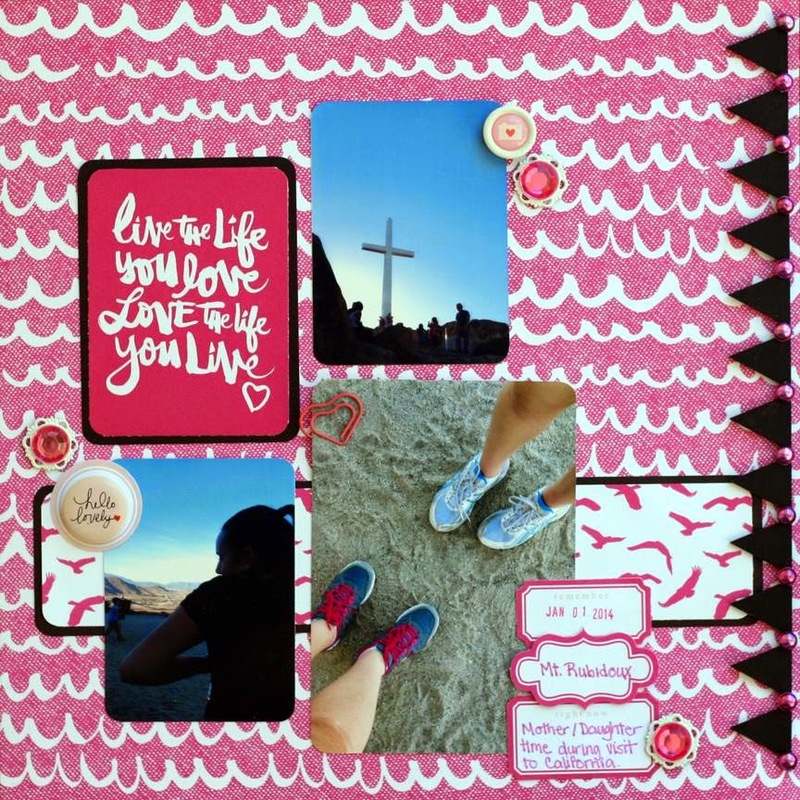 I really loved how the layout focuses completely on the photos!" 1. ‘flair’, in the lower left area that says, ‘hello lovely’. 2. A pink heart clip, from Webster’s Pages, on the photo of the shoes. 3. 3 pink Filigree Rhinestone Stickers from Freckled Fawn. 4. A wood border banner, along the right edge, painted black, from Studio Calico. 5. A button sticker from Freckled Fawn. Papers are from American Crafts and Webster’s Pages. 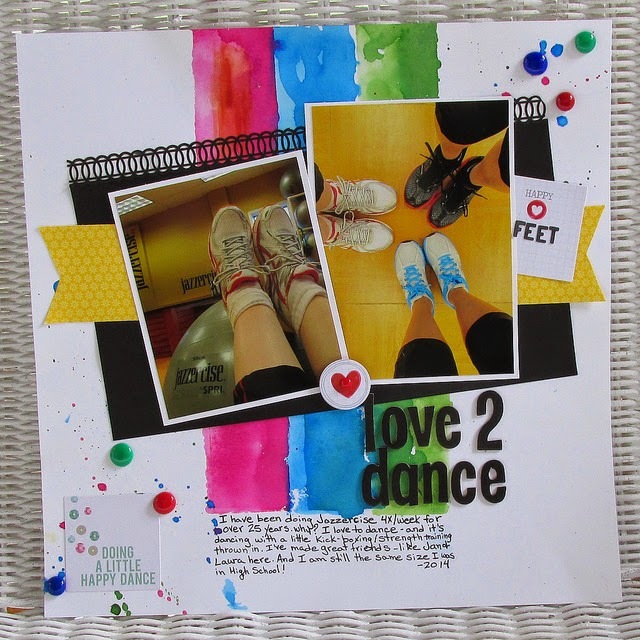 "This Challenge was the perfect opportunity to break out as much bling as I could! The word monochrome might sound a little boring, but a million different shades of the same color can be powerful! For the stash part of the Challenge I used: 1 glitter die cut banner, i glitter arrow, 2 gold foil vellum leaves, 2 word stickers, 3 pieces of chipboard, 1 gold doily, 1 gold clothespin and 2 wood veneers misted with, yep, gold. Whew! Have fun with this one!!" We want to see your monochromatic layout. :) Make sure you check out the details HERE. I always love beach, since that I was child and today I'm blessed for live near the gorgeous beaches. Our family have a lot of fun in the summer and of course I capture all the moments. The Design Team Call is closed. We will be announcing our new team members towards the end of the month! Stay tuned! This challenge was fun! but, I don't usually make monochromatic layout, because I love different colors on my page but love this! I used some patterned papers from my stash, as long as the color are the same. 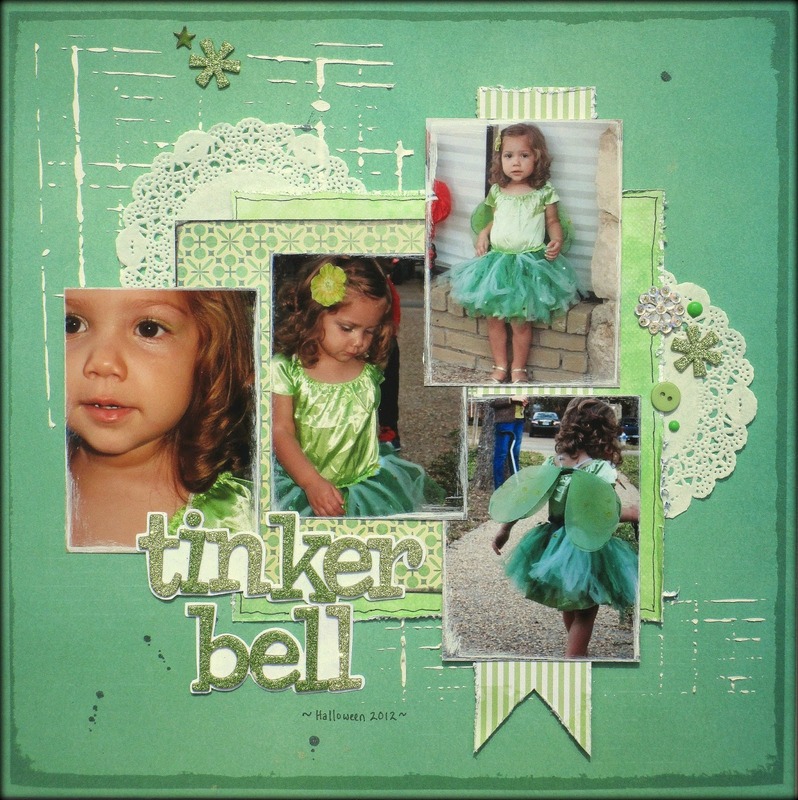 I created this layout using light green colors. She sure did work this Monochromatic challenge! DT Call is ending soon! Just a friendly reminder that our DT Call ends tomorrow night. If you would like to apply please review our original post HERE and get your application to us ASAP!